The Big Wobble: Yet another skyscraper fire in the United Arab Emirates points the finger at Shi'a sabotage? Yet another skyscraper fire in the United Arab Emirates points the finger at Shi'a sabotage? Fire ripped through a 75-storey Dubai apartment block on Wednesday, forcing police to evacuate the area in the latest of a series of skyscraper blazes in the Gulf state. 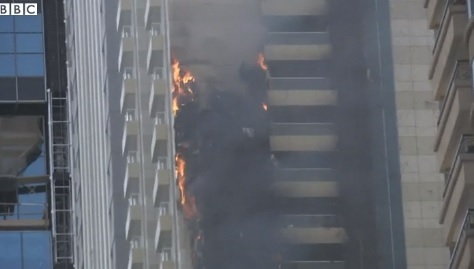 AFP reported burning debris fall from the facade of the Sulafa tower in Dubai Marina as the fire spread up at least 15 floors of the building. Sirens wailed as police cordoned off the area. Authorities said fire crews had evacuated the building and were working to contain the blaze. Dubai civil defence said no casualties had been reported. Fires have hit several high-rise buildings in the UAE, famed for its record-breaking skyscrapers. Earlier this month a huge fire erupted on the Ramool industrial area, resulting in severe damage to buildings. A Dubai Civil Defence spokesman said the blaze took hold just across from Festival City. "There were no injuries but there was a lot of damage, which included four workshops, 15 stores, two cars and four bedrooms that accommodate labourers," he said. In March this year a fire raced up a high-rise tower in the United Arab Emirates city of Ajman, the latest in a series of skyscraper blazes in the Gulf nation that is home to the world's tallest building. Images shared on social media showed bright yellow flames spreading up the side of the building as chunks of burning material tumbled to the ground. The Emirati interior minister, Sheikh Saif bin Zayed Al Nahyan, rushed to Ajman to help coordinate the response to the blaze, Ajman police said. Also in March this year an explosion ripped through a building in the capital's Al Khalidiya neighbourhood forcing residents to flee. The explosion, which caused a fire, happened about noon on the mezzanine floor of Al Mansoori building in the Daratul Miya area. Fifteen people were left with minor to moderate injuries, including smoke inhalation. All were taken to hospital. A Civil Defence member suffered heat exhaustion, the Ministry of Interior said. Ten vehicles parked near by were damaged, as were shop displays. 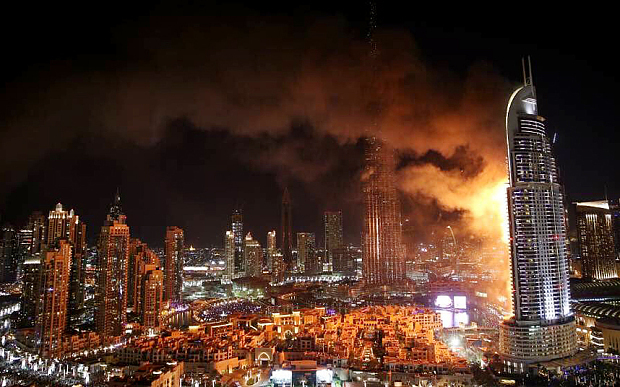 At the stroke of midnight, the skies over the city were painted by a colorful pyrotechnical display while firefighters continued to battle the stubborn blaze devouring the facade of The Address Hotel. Meanwhile, Dubai officials were counting their blessings and resettling the escapees from the burning 63-story tower, which is located just down the street from the Burj Khalifa, the world's tallest building.